For the past couple years, I’ve been on an unending quest to discover, read about, and explore everything I can on the subject of monograms. Along the way, I’ve collected a bunch of links to online sources, built up a little collection of monogram-related images on Pinterest, and bought a bunch of out-of-print, in print, rare, and easy-to-find books on the subject. In other words, I glutted on the whole monogram thing! Paul over on BibliOdyssey – a blog on books and illustration which I follow pretty faithfully – wrote about one of my favorite old books this week. 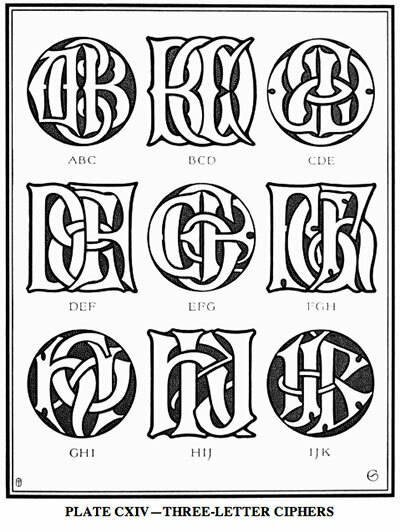 It’s called Monograms & Ciphers, by Albert Angus Turbayne, who was an American designer of books in the late 1800’s – early 1900’s. The book was reprinted several times – even by Dover in the 1960’s or so – and it’s available pretty widely online through used book sellers, for anywhere from $1 upwards for the Dover edition. But the nice thing is, Monograms & Ciphers is also available on Project Gutenberg for free. There are many things to like about this book, if you like monograms. It’s loaded with combinations of letters drawn in various styles, so it’s a great pattern resource. There’s also good information in the book – though it is primarily a “picture” book. For example, Turbayne takes pains to explain the difference between a monogram and cipher, a distinction that isn’t often clearly made anymore. Today, we use the term “monogram” pretty loosely to describe any decorative letters (one initial, two initials combined, etc.) artistically rendered. Technically, a “monogram” is combination of letters that have become one (hence, “mono”gram) through the way they are combined. 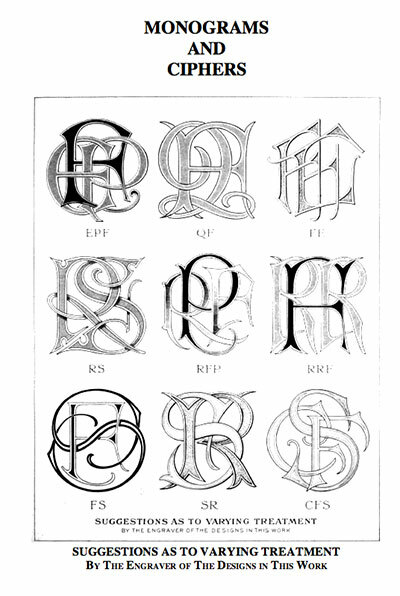 An individual letter – a decorative initial – is not technically a monogram. It’s an initial. And a monogram differs from a cipher, according to Turbayne. A monogram is one unit of combined letters that can’t be taken apart – if you take them apart, you lose the letters. A cipher is a combination of letters in which the individual letters retain their individuality. In any case, the terms are rarely used accurately anymore, which I think is a shame. But then, I’m just as guilty of not using them accurately as anyone else is! 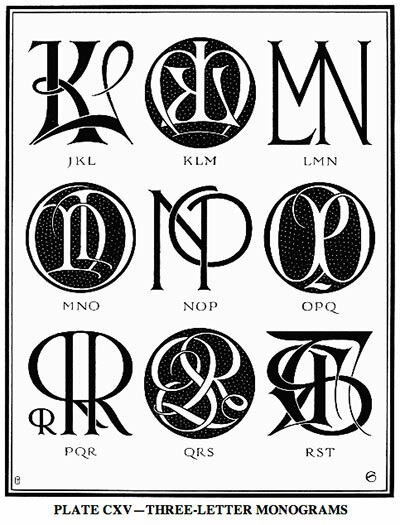 If you’re a lover of monograms, ciphers, and decorative initials, stop by Project Gutenberg and add Monograms & Ciphers to your resources! The Book of Ornamental Alphabets, Ancient and Medieval. You can click on the alphabets in this one, for larger, clearer images. Hope you enjoy meandering through them! 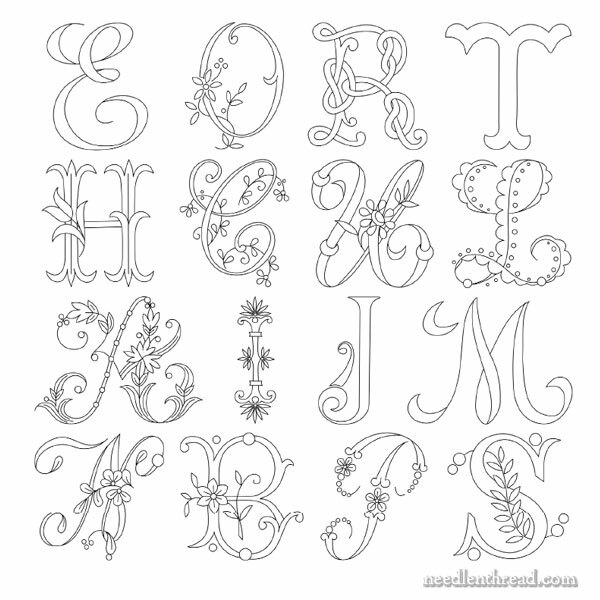 If you’re looking for monograms to embroider, you’ll find a collection of 16 beautiful alphabets all in one place in Favorite Monograms, a downloadable PDF collection of 16 monogram alphabets perfect for hand embroidery and other crafts. May 29, 2018 Embroiderer’s Book of Design – Nice Pattern Resource! I somehow stumbled upon your article about your “orts” as you called them. (I’m boring and just call them “strings”!) I’ve always just thrown them away, and I think it seems wasteful. I sew, too, so I’m always throwing away a pile of strings here and a pile of strings there. Now that I know someone else saves their “orts” I won’t feel bad doing so! I’m unsure of what I will do with them, but I know that I will find some use. I am rather thrifty if I do say so myself! I have been saving my “orts” To make a colorful scarf. You just spread them out between to sheets of Water soluble Stabilizer. Then just run it through your sewing machine with a metallic thread. Waaaa Laaaa a scarf full of memories of past projects. Silly but exciting. Well we learn something everyday I didn’t know that there were different meanings to different combinations of monograms for want of another word, how interesting. Great that we can look at them for free at Project Gutenberg. You have certainly given us loads of websites to meander through as well food for thought. I hope you have nearly finished the Mission Rose! thanks for sharing these monograms websites with us. I just wanted to add that I have had the opportunity to see the alphabet monogram quilt at the Shelburne Museum. The central feature of a quilt designed and embroidered in the 1950s by Ida W. Beck, a master seamstress from Easton, PA. 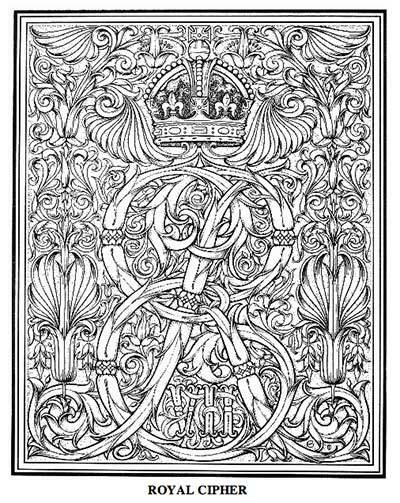 This unique monogram incorporates 25 of the letters of the alphabet in an intertwined pattern. The letter “I” was omitted, to prevent the design from centering on self, and to introduce a deliberate imperfection. The original quilt includes several other alphabets, and is now part of the Shelburne collection. The monogram design has been charted for counted cross stitch by the Posy Collection. Thank you for sharing all these resources with us. I’m looking forward to reading more. I’m sorry but I can’t be more eloquent than to say: “ooooh” “ooooh” “oooh”, the “oo” pronounced as in the word “too”. What fantastic resources! thanks so much for ferreting them out and sharing. I have recently become enchanted with monograms and initals – partly because of finding your blogs and seeing some beautiful examples. I am also smitten with whitework, which goes hand in hand with monograms. I am collecting these like a mad woman, and want to thank you for these new (to me) sources. I only wish I could find a good, pre-made monogram for JGB! I’ve got a book on my shelves that will interest you: Armenian ornamental script http://www.amazon.com/Armenian-Ornamental-Script-Khatcherian-Hrair/dp/B009477I8W. It is expensive, but well worth the investment. I have never seen such beautiful lettering. And stylish it is a cross between the east and the west. A bit like the Celts, but then with a strong eastern influence. It is a shame you live so far away that you can’t just come for a cuppa and have a browse :). I have been trying to find a source on how to combine letters to make monograms and a book that explains how to make monograms. Do you know of any books like that? Same here. I have found many great individual letters, but have failed at trying to combine them. I see there is plenty of machine embroidery software available to do this, so maybe we have to take that route and then just print the design and stitch by hand? Well, there is a book that discusses this point, because I know I read about combining letters somewhere, but I can’t remember which book it was. The gist of the thing is that you want to find a pleasing balance in the letters that you’re combining. The real question before starting is, do you want to create a monogram (where the letters, combined, for one indivisible design), or do you want to create a cipher, where the letters are combined neatly but retain their individuality? Most people work with ciphers more than monograms, when drawing their own designs for hand embroidery. And the easiest way to do it is to take two or three letters, enlarge the middle one if you’re using three (which is usually the initial of the last name), situate the other two to each side (first and middle initial, left and right side, or wife / husband initials, left and right side), and then re-draw them (trace them, for example), using a logical over-under sequence where the letters overlap. That’s what I do, anyway. You can also mix up the style of the letters involved. The main letter, for example, might be very elaborate, while the other letter (first initial in a two-letter cipher, or first and middle initials in a three letter cipher) might be very clean and simple. It just depends on the look you’re after. I’ll probably discuss this topic a little further down the road. It’s also part of the class I’m preparing, but that won’t be for a little while. Thanks for another interesting article, I would have thought the meanings of cipher and monograms would be opposite, but only because of the other meaning of the word “cipher” and because I often find the initials woven into one form to be very difficult to figure out. LOL! 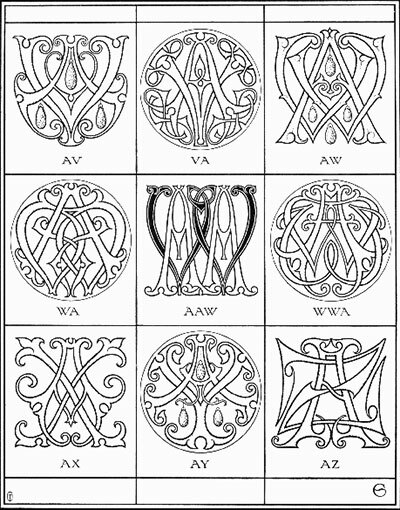 In addition to the wonderful Project Gutenberg, I also highly recommend the Antique Pattern Library (http://www.antiquepatternlibrary.org), for everyone working in the decorative arts. It has a companion Yahoo group, in which announcements of new entries into the Library are posted, which I find very helpful as well. I am looking for a counted cross stitch monogram using three initials but the center initial slightly larger than the other two. Is there a resource for this? Or is there someone you know that I can have them take the initials and make a cross stitch pattern for me? Can u draw up a monogram with the letters CHA (no specific order or arrangement) using the CXV-plate? I love that styles. Next Next post: Introductions All Around – for All your Needlework Needs!